The BlackPed Tool – Bosch & Yamaha Tuning via Smartphone! The innovative BLACKPED tuning module enables a perfect fusion between your Smartphone and your electric bicycle – use this device to turn your electric bike into a real smart bike! First and foremost, the BLACKPED module (www.blackped.com) is a reliable E Bike Tuning Tool which de-restricts the speed limit of Bosch engines (Gen1: Classic Line / Gen2: Active, Performance & CX Line) and Yamaha Powerdrive engines. Brand-new is the innovative BLACKPED+ module which is compatible with Bosch Gen2 and Yamaha Giant Syncdrive engines (with RideControl EVO and CHARGE displays). The unique feature of the BLACKPED modules is that they can be comfortably controlled with your Smartphone. This works completely wirelessly via the free BLACKPED app (connection per Bluetooth). That allows you to optimize your electric bike in many ways – for example, you can set the maximum engine support individually from 15 up to 75 km/h. Furthermore, your Smartphone display can show you lots of useful data when you are biking (distance, max- and average-speed etc.). Especially the groundbreaking BLACKPED+ module will turn your Smartphone virtually into the sophisticated Bosch Nyon display – the amount of parameters displayed is really astonishing! Off course, your Smartphone display will always show the correct speed, too. Our tip: To make sure you´ll always have a good a good view on your Smartphone display while you are on the road, we recommend you to order the optional FINN Smartphone holder for your handlebar, too. Furthermore, you can order an optional Smartphone charging cable which enables you to charge your phone conveniently via your electric bike´s battery (micro USB to micro USB or Lightning). Both versions of the module, “BLACKPED” and “BLACKPED+”, can be conveniently activated via your electric bike´s light switch. In principle, you only need your Smartphone to determine the settings of your BLACKPED module. After that is done, you can use the device without your phone, too. Put briefly, the BLACKPED modules offer much more optimization options than most other tuning tools. These are high-quality products made in Germany. How do the BLACKPED modules work? If a BLACKPED module has been installed, it will divide the transmitted speed by an individually established value – this has the effect that the maximum engine support will be raised significantly. As a result, you can theoretically drive up to 75 km/h with full motor support! By the way: The BLACKPED (& BLACKPED+) tuning tools are not only compatible with “normal” electric bikes (engine support up to 25 km/h), but also with much faster S-Pedelecs (engine support up to 45 km/h or more). Simple Installation: The installation of the BLACKPED modules is very easy and can be done within a few minutes. The installation won´t damage any cables – that means, you can restore your electric bike´s original condition whenever you want to. Our Recommendation: Before you order the BLACKPED module, you should download the free BLACKPED (or BLACKPED+) app for testing purposes. Check out if it runs on your Smartphone. If this is the case, you can order the BlackPed modules exclusively in our shop. Values in the Smartphone display: Max Speed, Total Time (total journey time), Average Speed, Distance, Total Distance, Current Speed, km/h – mph Conversion. Km/h – Mph: You can switch between km/h and mph by briefly clicking on the km/h / mph button. Reset: You can reset each value by a long click on the respective value. Visibility: If desired, the BlackPed App can stay visible on the Smartphone display. You can set the duration of the visibility between 0 to 240 seconds or even limitless. Total Reset / Factory State: By clicking ten times on the light switch at the electric bike display the PumaPed module will be set back to its original state. If the visibility had been set to limitless, you can make the PumaPed module only visible again if you reset to the factory state. Always ON / OFF: The BlackPed is basically always on or always off. Temporary ON / OFF: If the BlackPed module is always activated, it can be temporarily switched on or off (for example, at a certain track section). You can use these function conveniently via the light switch of your electric bike display, if the “Headlight Activation” feature is activated. Headlight Activation / Activation via the Light Switch: If this function is activated you can switch the BlackPed on or off via the light switch at the electric bike display. Function: Light on, module activated – light out, module deactivated. Divide: Indicates the value at which the speed will be divided (15 km/h to 50 km/h). If you own a normal electric bike, you should choose value less than 25 km/h, if you own a faster S-Pedelec, you should choose a value less than 45 km/h. Freeze: Here you can choose the value at which the displayed speed shall be frozen (from 10 km/h up to 50 km/h). Divider / Maximum Motor Support: The value by which the speed will be divided (0,6 to 3,0). Use this feature to define the value of the maximum motor support in km/h. Wheel Size: Your electric bikes wheel size in centimetres (or 20” to 29”). Module Name: Here you can enter a name for your module or for your electric bike (max. 10 characters). If you use several BlackPed modules this enables you to address each one individually (for example “MyBike”, “WifesBike” etc.). Anti Theft ON / OFF: You can use this feature to activate or deactivate the engine support. PIN Request: Use this feature to define a PIN code which has to be entered if someone wants to connect to the BlackPed module (no longer supported). Screen Lock (only PumaPed 2): The PumaPed App stays visible on the Smartphone display. You can set the duration of the visibility between 30 and 240 seconds (see Visibility). Always: The PumaPed is basically always activated or nor not activated. Temporary: If the PumaPed is always activated, you can use this feature to switch it on or off temporarily. Divide Speed: The speed at which the module starts to divide (15 to 50 km/h). Divider: The value by which the speed will be divided (1,2 to 3,0). Wheel Diameter: Your electric bicycles wheel diameter in inches (24, 26, 27.5, 28 or 29). Module Name (only PumaPed 2): You can use this function to give a name to your module or your electric bike (max. 10 characters). Motor: Here your kind of engine is shown to you. The selection of another engine will have no effect. Anti-Theft (only Android App): You can use this feature to activate a 10 km/h limitation of the engine support. 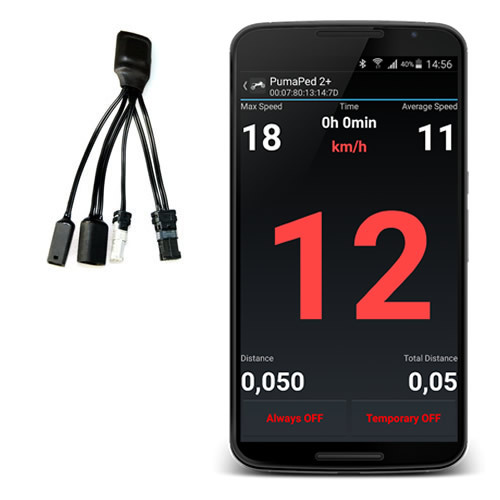 Visibility (only PumaPed 2): The duration of the display visibility (30 to 240 seconds). 1. You can only make settings below a current speed of 15 km/h. 2. The App automatically connects to the last module. If you got different modules, you initially have to click on the “back button” (next to the name of the App) and choose the particular module again. 3. If the connection is interrupted, module and App will connect again automatically. 4. If you have set the visibility to value 0, you have to carry out a total reset via the light switch of the electric bike display if you want to have access to the PumaPed module again. If you have a Bosch engine and the light function has not been unlocked, you have to go to your electric bike repair shop to get it unlocked. After this is done, you can make a total reset (restore to the original condition).